Locations of Sales: Online Store & also available at our Tsuen Wan Retail Shop. The Best Choice of Brown Changtai: Cloud is of the view that we cannot simply score the various types of Brown Changtai by the date of production. The best choice with the great tea broth sensations is the King of Brown Changtai. The 2nd best is the later one being produced in 2004, the Ba-ba Brown Changtai. The 3rd choice is the one being produced in the middle period, the Dual Secret Stamps Brown Changtai. In fact, Dual Secret Stamps Brown Changtai is a very good tea indeed. However, it is just the fact that the King of Brown Changtai and Ba-ba Brown Changtai are even better and more attractive with extremely good quality. 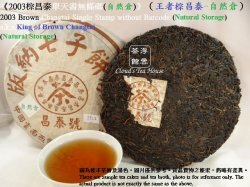 “Brown Changtai”, as its name suggests, is the tea cake with a brown wrapping paper under the brand of “Changtai Hao”. 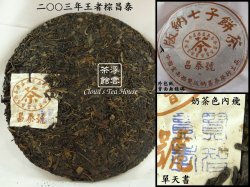 The Brown Changtai tea cakes were manufactured by Changtai Tea Shop (renamed as Changtai Tea Group thereafter), between 2003 and 2004 (different manufacturing period for different batches). “Stamp” means the stamp being sealed on the trademark ticket, which is embedded in the tea cake. Except for the Changtai Tea Group, it is believed that no one can interpret the meaning of the stamps. 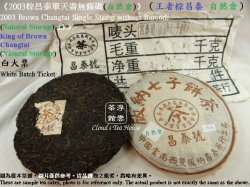 There are some Brown Changtai tea cakes with a single stamp on the trademark ticket, they are called “Single Stamp”; and there are some with two stamps, they are called “Dual Stamps”. The “Stamp” is the most concrete evidence to prove the year of production because the trademark ticket was tightly attached on the tea cake. You must firstly identify the “Stamp” to tell the batches. “Barcode” is the product barcode and product details being printed on the wrapping paper at the back of the wrapped Brown Changtai tea cake. In the past decades, there was no regulation to guide the product barcode or product description. 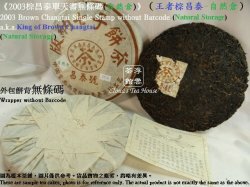 Those wrapped Brown Changtai tea cakes without “Barcode” are believed to be an earlier batch than those with “Barcode”. 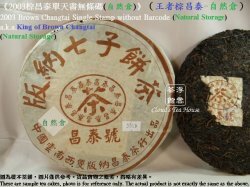 The manufacturing period of “Dual Stamps Brown Changtai” is in the middle of the entire batch of “Brown Changtai” between 2003 and 2004. Since it was the transitional period of wrappers, you will notice that “Dual Stamps Brown Changtai” were wrapped by two different types of wrapping paper（with the Barcode and without the Barcode）.